We are a specialized home appliance repair company in Passaic, New Jersey, and offer local services. You can trust our team to fix appliances and replace their worn parts. What we also do is inspect and maintain them. Want to install a new dryer, washer, or stove? You can still turn to our Passaic Appliance Repair for assistance. What you need, we provide. And it will be our honor to take care of your home appliances and thus your concerns. Want appliance service in your laundry room? Contact our experts. We repair washing machine problems and take care of dryer complications in a timely manner. Trained to fix top and front load appliances, our techs can fix any model. Is your washer leaking? Is the dryer clogged? Rely on us to provide same day appliance repair service. Need gas range repair? Are you in urgent need of same day fridge service? One of our kitchen appliance technicians will be at your home fixing the problematic unit in no time flat. 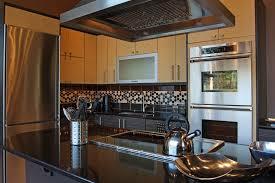 We repair all kitchen appliances, including microwaves, icemakers, and other small units. Our customers can count on our quick response and effective appliances service. We cover emergency needs in a hurry and will be there to replace parts and take care of any issue. Appliance problems cause inconvenience but often hazards too. So one of the main policies at our Appliance Repair in Passaic is quick response. Each pro makes sure his truck contains all tools and spares he needs for the job. We are available to cover same day requests and prepared to replace the components of all appliances. With expertise and honed skills, our appliance repair technicians do their job with accuracy. No matter which service you need, rest assured that we will handle it with respect. We are qualified and licensed and at your disposal to cover your home appliance service requirements in Passaic, NJ. Call us.